For the third time, Greece’s Council of Appeals Court Judges has to decide if Andreas Georgiou committed a crime. A “yes” will mean a trial. A conviction could mean a life in prison. Although the same court acquitted Dr. Georgiou twice, again, Greece’s Supreme Court refuses to drop the charges. His crime? Reporting accurate statistics. And whatever they decide could affect the newest round of bailout negotiations. Our story starts during 2010 when Andreas Georgiou, a former IMF official, was brought in to overhaul the Greek statistics office. First, an initial revision inflated the deficit (the amount by which expenditures exceed revenue during one year) from 3.7 percent of GDP to 13.6 percent. Then though Dr. Georgiou took it further to a whopping 15.4 percent–a record eurozone level. As you know, the impact on the country was calamitous. Georgiou’s revised deficit and GDP figures necessitated an unheard of discipline in order to secure the bailout loans it needed from the international community. Gargantuan government spending had to be cut, government employees fired, government pensions slashed. One woman who attended Georgiou’s trial said, “This man helped to destroy our country and ruin my family.” Like her, many others lost their jobs and their retirement money. 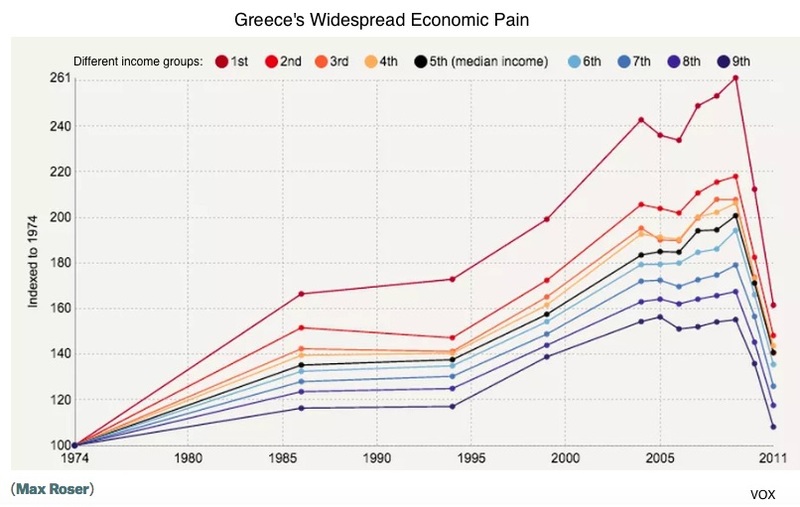 Meanwhile the Greek economy was still sinking. As late as the summer of 2015, their debt to GDP ratio was close to 172% and unemployment exceeded 25%. Many worried that the country’s most talented people were leaving. You can surmise why some sentiment against Dr. Georgiou lingers. Defined as the Greek government’s spending, taxing and borrowing, their fiscal policy has been catastrophic in all three areas. Through publicly owned money-losing enterprises and generous pensions, they overspent. Unable to cover their obligations with tax revenue, they borrowed gargantuan sums. Unable to pay the money back, they avoided a massive default through a bailout plan that began in 2010. Recently, the bailout has again been in the news as monetary officials discuss loan extensions, bond buybacks, and even Andreas Georgiou. Greece’s anti-Georgiou sentiment has them worried that Greece still might not be statistically dependable. My sources and more: For the Georgiou case and the Greek economy, WSJ, Bloomberg, and FT had the update while Vox had the economic statistics for 2015. Lastly, if you want to read onward, “Greece’s Least Wanted Man Lives in Maryland,” has the Georgiou facts. Please note that sections of today’s post were previously published at econlife. Also, after publication, we edited deficit statistics to (we hope) improve their accuracy.